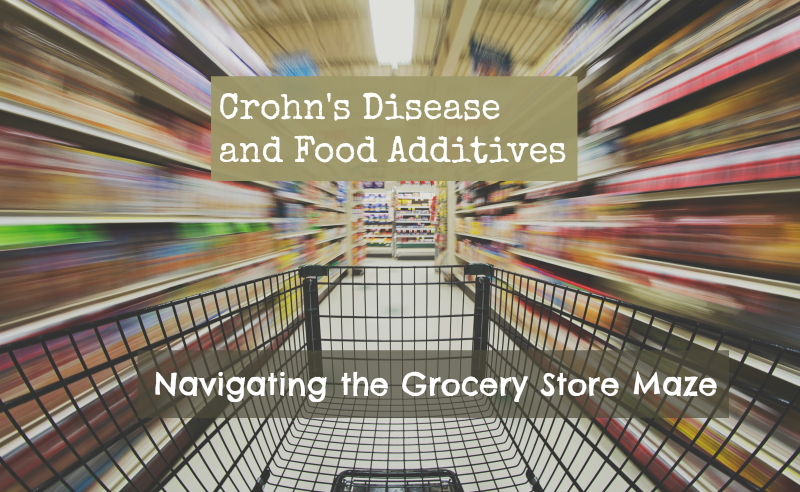 Carrageenan, maltodextrin, polysorbate 80, xanthan gum, carboxymethylcellulose… These common food additives are “generally recognized as safe,” but is that true for people with Crohn’s disease and other inflammatory bowel diseases? 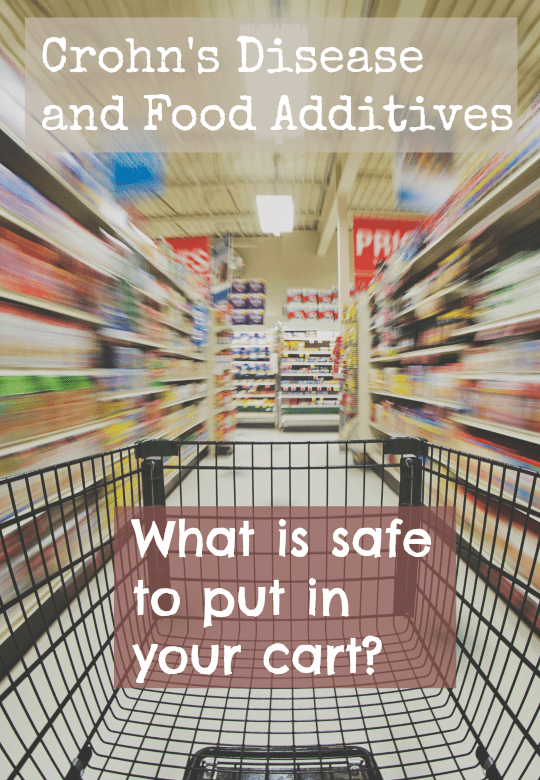 Evidence is mounting that they may not be and in this post I discuss each one and why foods with these on the ingredient list should probably stay out of our grocery carts. This common food additive is made from red seaweed and is found in many “natural” and even organic food products as a thickener or stabilizer, often as a substitute for fat. You’ll find it in ingredient lists on everything from ice cream to deli meats. According to the Cornucopia Institute, the unique chemical structure of carrageenan triggers an innate immune response in the body, which recognizes it as a dangerous invader, which leads to inflammation of the digestive tract. Scientists have been concerned about carrageenan since the 1960s when a scientific study showed it caused ulcerative colitis in guinea pigs. Anecdotally, many otherwise healthy individuals experiencing gastrointestinal symptoms have noticed that eliminating carrageenan from the diet leads to profound improvements in their gastrointestinal health. Carboxymethylcellulose or cellulose gum is an emulsifier that is widely used in ice cream because it eliminates the need for extreme low temperatures or a churning mechanism. It is also used in baked goods as a way to reduce costs and produce a lower fat product. You may also find it in chewing gum, margarine, and peanut butter. An article published in the journal Nature reported that adding emulsifiers such as carboxymethylcellulose to the diets of mice genetically engineered to be prone to inflammatory gut diseases increased the severity and frequency with which the animals developed inflammatory bowel disease. The researchers suspect that the emulsifier can break down the heavy mucus that lines the gut and prevents bacteria from coming into contact with gut cells. Maltodextrin is derived from starch (usually corn or tapioca) that is commonly used as a thickening, coating or filling agent. It’s found in thousands of food items including sports drinks, artificial sweeteners, potato chips, salad dressing and beer. A researcher at the Cleveland Clinic discovered that maltodextrin alters intestinal bacteria so that it sticks more to the surface of the epithelium – the layers of cells that line the intestines. In healthy people, the bacteria is prevented from sticking to the epithelium because the cells make a layer of mucous, a thick gel-like substance. People with IBD have a much thinner mucous layer or are missing it altogether. In another recent study, the same lab found that maltodextrin promotes survival of salmonella, a bacterium commonly associated with food poisoning. The research also indicates that maltodextrin can increase the amount of bacteria on the surface of the gut epithelium, as well as decrease antibacterial defenses, creating the ideal environment for developing Crohn’s disease. Like carboxymethylcellulose, polysorbate 80 is an emulsifier that is often used in ice cream because it provides a firmer texture that holds its shape as the ice cream melts. You might also find it in supplements like fish oil capsules and even in prescription medications. In addition to causing the same problems as carboxymethylcellulose, another study found that polysorbate 80 increased the presence of Crohn’s mucosa-associated E coli. Sucralose is a non-nutritive sweetener that is 600 times sweeter than sucrose and used in breakfast cereals, beverages, desserts, toppings, fillings, chewing gum, breath mints, fruit spreads, salad dressings, confectionary, bakery products, processed fruits and vegetables, alcoholic beverages, puddings and table syrups. Sucralose may have an impact on gut bacteria, digestive protease inactivation and gut barrier function. In 1991 Canada was the first country to approve its use in food. Prior to this date the prevalence of IBD in Canada was much lower than in other countries with similar ethnic and racial demographics but a sudden increase in cases began in the early 90s and today Canada has the highest rate of IBD of any country. Xanthan gum is produced through fermentation of sugars (usually from corn) with a particular bacteria. It is then dried and powdered and when reconstituted with liquid creates a sticky substance. You will find it in baked goods, particularly those made with gluten free flours, and sauces because it allows fats to remain suspended in other liquids. Xanthan gum swells in the intestine, which stimulates the digestive tract to push stool through. This laxative effect may explain why some people report that it causes them to have bloating, gas, and diarrhea. There does not appear to be any scientific research into xanthan gum and inflammatory bowel disease, but enough anecdotal evidence that it is worth paying attention to and eliminating from your diet if it does bother you. Special attention should be also paid to the technologies used in the packaging industry. I had my main triggers figured out a few years before finally being diagnosed with Crohn’s. Like your list, Carrageenan is my #1 trigger. Not on your list are Annatto and Nitrates. I’m going to watch closely for the rest of your list, although Xanthan and other gums generally don’t bother me. BTW I have the rarer “constipation” type Crohn’s, not the more common “diarrhea” type, so maybe that affects triggers. Thank you for your comment. It does seem that everyone is unique when it comes to which additives are must troublesome. I also prioritize avoiding carrageenan but am not as concerned about the gums. But of course, eating unprocessed and real foods without additives is always going to be the best bet! There is not as much evidence to suggest we must avoid guar gum as there is these other additives, but I still stay away from all added “gums” and advise my clients to do the same.